Tethered to the banks of Dal Lake, this is an offering of a private room in a houseboat. The room on offer can accommodate up to three people, and is ideal for leisure travellers. The host provides all meals on request. 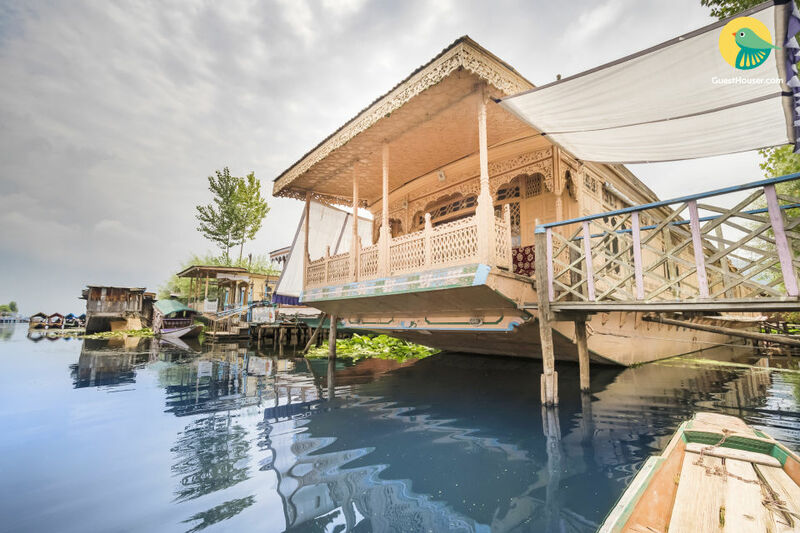 Your Space Designed with khatamband ceilings, carpeted floors, elegant chandeliers, traditional pinjrakari artisan, this houseboat promises modern comfort. 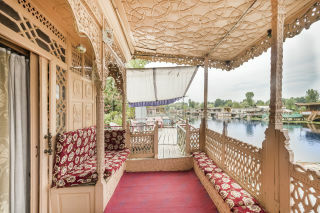 Platform seating is provided on the deck for you to sit back and admire the stunning view. Inside, the living room houses plush sofas with coffee tables, a television, a writing desk, and a well-curated bookshelf. The dining room has ample dining space for mealtime convenience. 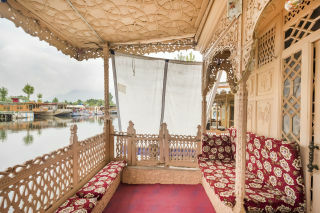 The room on offer is furnished with a comfy doubled bed, coffee seating, a wall-mounted mirror, and a spacious wardrobe. The en suite washroom is tiled and appointed with western sanitary ware. Guest Access The guests can access the common living space and the well-stocked bookshelf. 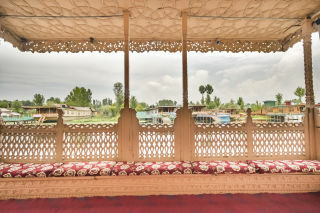 Outside seating area with a view of the lake is also accessible. Guest Interaction The host welcomes the guests on arrival and provides any assistance required. 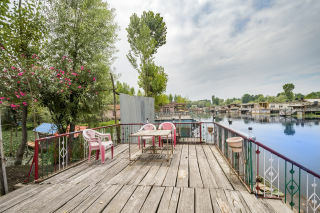 Neighbourhood Overview The houseboat is surrounded by uninterrupted nature and the tranquil Dal Lake. Getting Around The host provides assistance to guests to arrange transportation. Additional Information All meals are available on request. 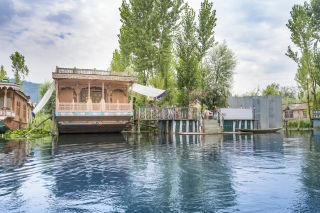 Other places of interest worth visiting are the most sacrosanct Muslim shrine Charar-i-Sharif, the ancient Dastgir Sahib Shrine and the charming Chashm-e-Shahi Gardens.